I read this article and found it very interesting, thought it might be something for you. The article is called The Cyber War Against Tibet and is located at https://tibet.net/2019/02/the-cyber-war-against-tibet/. Cyberattacks are having a chilling effect on the Central Tibetan Administration and Tibetan diaspora. Cisco Talos, a group of world-class researchers, analysts, and engineers, recently uncovered a new cyber espionage campaign delivering a malicious Microsoft PowerPoint document using a mailing list run by the Central Tibetan Administration (CTA). The document is a copy of a legitimate PDF file titled “Tibet was never a part of China,” which is available for download from the CTA’s website tibet.net. The malicious version, however, contains a Remote Access Trojan (RAT). The email is targeted at pro-Tibet groups and individuals in order to distribute what has been dubbed ExileRAT. The attack delivers an Android- and Window-based Trojan capable of stealing system and personal information, terminating or launching process, or carrying out surveillance and the theft of data. As the volume and sophistication of cyberattacks grow worldwide, it is essential for the CTA and Tibetan nongovernmental organizations (NGOs) to take necessary precautions to protect their sensitive data and personal information of employees. The Tibetan community has been persistently targeted by digital espionage operations for over a decade. The scale of China’s operation was not clear until 2009, when the University of Toronto’s Citizen Lab released a report titled “Tracking Ghostnet.” The report explicitly laid out, for the first time, the scope of cyber espionage and how deeply it had infiltrated the Tibetan movement, including the office of the Dalai Lama. The recent cyber espionage attempt targeting the CTA and Tibetan NGOs is just one facet of more comprehensive and sophisticated cyberattacks perpetrated by Chinese state-sponsored hackers. The goal is primarily to gain entry into the network system of the CTA, and consequently to monitor activities and extract information using various social engineering techniques. Figure 1: Most spear-phishing files come in .zip format. 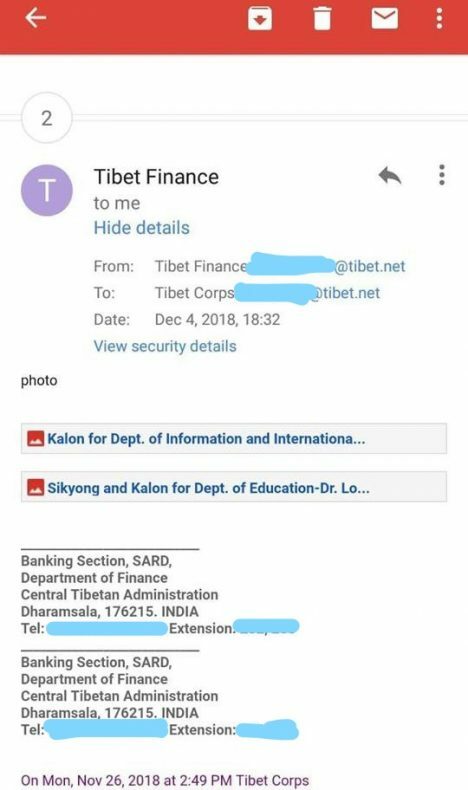 Hackers usually dress .zip files as other files in disguise, as in the below screenshot showing a malicious email sent into Tibet Corps in December 2018. Attackers focus primarily on gaining access to Google accounts and more recently into the personal WhatsApp accounts of CTA staff. They have been targeting researchers of the Tibet Policy Institute and staff of the CTA’s Department of Religion and Culture. In an interview with the author, malware analysis expert Tenzin Chokden of the TCRC said: “Scammers are tricking staff of CTA into clicking on fake links that are identical to original attachments, and then [the attackers] steal people’s information and data. Staff are targeted via email and Google drive to their Gmail account. The emails often include an attachment or file, resembling a standard email. Many receivers mistakenly presume it to be from their trusted friends or colleagues. “While it looks like a standard PDF file with Adobe icon, when clicked, this opens a new tab with a page which closely resembles the real Gmail login page, and asks the user to log in again. However, the page is actually a portal for hackers to steal targeted email addresses and passwords, and get full access to the user’s account.” And even worse, if the user uses the same login details for other websites or accounts, the hackers will be able to gain access to these details. This example clearly indicates that one of the email account’s details are already compromised. The file names are broadly categorized under different set themes, including project-related, the budget, and diplomatic issues, largely determined by the types of organizations the hackers are targeting. This type of attack is known as spear-phishing: sending common emails from identical addresses to many email addresses, hoping that just some of the malware recipients will click on a malicious link (even if by accident) or download an infected file. It pays off for the hackers: the infection rate can be as high as 50 percent. The cyber espionage campaign is evolving tactics but the operations keep the CTA and its staff as their prime target. The attackers rely more and more on spear–phishing instead of malware and other attacks. 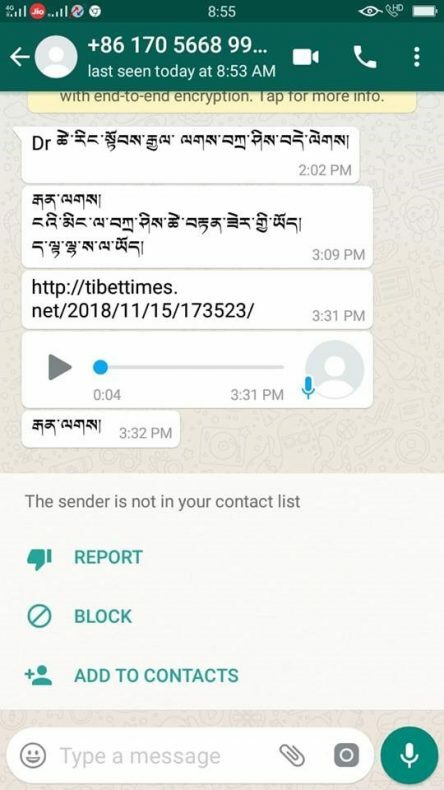 Figure 2: A WhatsApp message sent from Tibet to a staff member of the Department of Religion and Culture on December 5. The number is registered in Lhasa. These attacks are often designed to target a large number of victims at once. Any such occurrences should immediately be reported to experts; it’s unlikely only a single person would receive such a message. The safest approach is to keep away from unidentified numbers and email IDs, who sends links anonymously. The TCRC observes that of the cyberattacks on the CTA during the last many years, more than 90 percent are spear-phishing attacks. This is primarily aimed to steal the project ideas and schedules according to Namgyal Lekshey. But some hackers are increasingly using sophisticated techniques. They adopt new techniques to conceal their activities. Due to the frequent attacks and complicated inter channel relations within Chinese cyberspace, it is really hard to prevent cyberattacks completely. It’s very difficult to put technical controls into place to prevent humans from making mistakes. To stymie these attacks, email users have to do the right things by following safe and secure practices. Updated software is needed for PC and mobile applications. 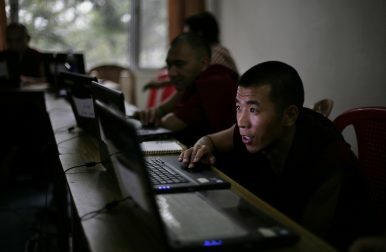 To minimize the number of cyberattacks, Tibetan computer users should be aware of the risks involved in opening unsolicited attachments and suspicious links through email. Similar messages are used to steal people’s personal information. Unless you trust the sender, don’t click links or reply with personal information. The hackers are having a two-fold impact. Beside deliberately exploiting Tibetan computer systems — including installing surreptitious monitoring program on computers and creating fake IDs – they more indirectly weaken the harmony of the community by disrupting the ability of Tibetan exiles to exchange information and communicate through the internet. Tibetan communities should be aware that the systems are built to certain security standards, they should be properly trained to prevent cyberattacks that target the disclosure of important files. Tibetans both as individuals and as a community are being targeted with some of the most sophisticated malware attacks and cyber surveillance by the Chinese government. As long as Tibetans equip themselves with the knowledge and skills to defend against such attacks and understand the threats involved, technology can be one of most powerful tools in the struggle for freedom. Tenzin Dalha is a research fellow at the Tibet Policy Institute, doing research on Chinese cybersecurity policy and the social media landscape of Tibetan society. Views expressed here do not necessarily reflect those of the Tibet Policy Institute.